This has to be one of my favourite sides. It goes excellently alongside fish, meat or a tray of roasted vegetables and it is incredibly easy. Feel free to sub hazelnuts for other nuts if you wish. Toasted flaked or chopped almonds go very well too. Preheat your oven to 200°C fan setting. Wash and trim your leeks and halve them lengthways. Arrange onto a roasting tray and dot the butter evenly amongst them. Sprinkle generously with sea salt and thyme leaves. Bake for 30 minutes basting with the butter half way through. 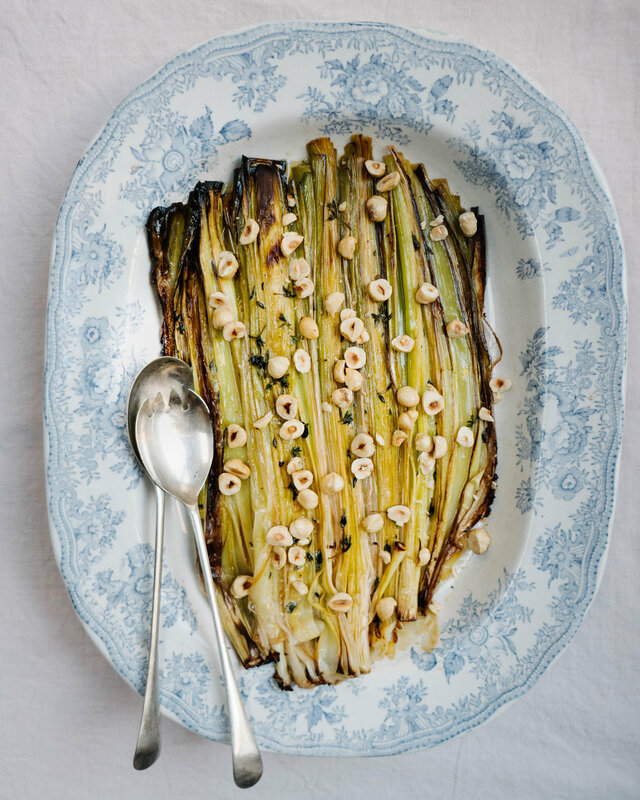 (Simply tilt the tray and use a spoon to collect the buttery juices to drizzle over the leeks. Once soft and slightly caramelised remove from the oven. Transfer to a serving dish and sprinkle over your hazelnuts.